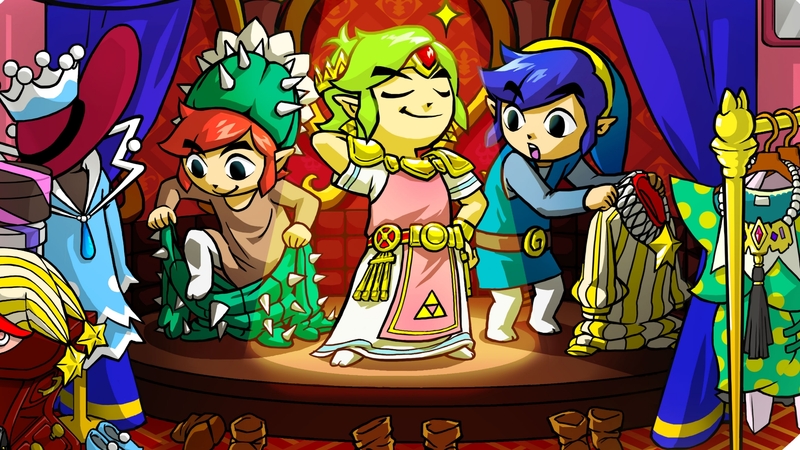 Daily Debate: Were Outfits the Best Part of Tri Force Heroes? Tri Force Heroes is seemingly no one’s favorite Zelda game, if our recent list is anything to go by. It had some great ideas, but an incessant multiplayer fixation scuppered its appeal for many. Finding enough players via online communication invited many a relentless troll, local player wasn’t much better. It felt like screwing over your team mates in parts was encouraged, and rightly so, it was a blast. But for the less vindictive of us, actually working together to tackle the small yet puzzle-dense levels could be great fun, helping each other out through items or the perks of costumes. Link in that dress wasn’t just for show after all. Made by collecting incredibly scarce materials from the ends of levels or bought from the local peddler, individual Link’s could wander the Drablands in all manner of garish garment. Much like the masks of Majora’s Mask they each bestowed unique effects, which is where Tri Force Heroes shone most brightly. Link has always been a blank canvas of sorts, so seeing him in a Tingle Outfit, a Goron onesie or an Ice Climber parka just kinda worked. We’ve seen him as a wolf, so why should cheetah print be off the cards? These costumes only offered minute changes to gameplay, and while far more cosmetic than masks were, offered little in way of puzzle solving. I wonder, if Tri Force Heroes was instead a traditional single-player game and the outfits were used much the way masks were, would the game have been more enjoyable? A more whimsically toned Majora’s Mask, where a costume change was necessary for a dungeon, travel or even a boss. I really enjoyed Tri Force Heroes, I just wish it didn’t demand I traveled as a trio and let me explore a more expansive world, one that was less bite-sized. But what do you think? Would you like to see more customization options for Link in the future? Would you like to see the return of masks or costumes? Is Tri Force Heroes fine as it is? Sound off in the comments below!